Don't grab drinks, make them. What's more romantic than sticky floors, butter powder-covered seat cushions, and a trite film? Ah, the theater—a place where two tickets cost more than all the gas you've used this week and the employees' demeanor are enough for a man to forsake any belief that hope exists anywhere. Skip it. Skip the line, skip the gallon-size sodas and overpriced, well, everything, and do something fun instead. Do something that lets you show off talent you never knew you had, and do something impressive. 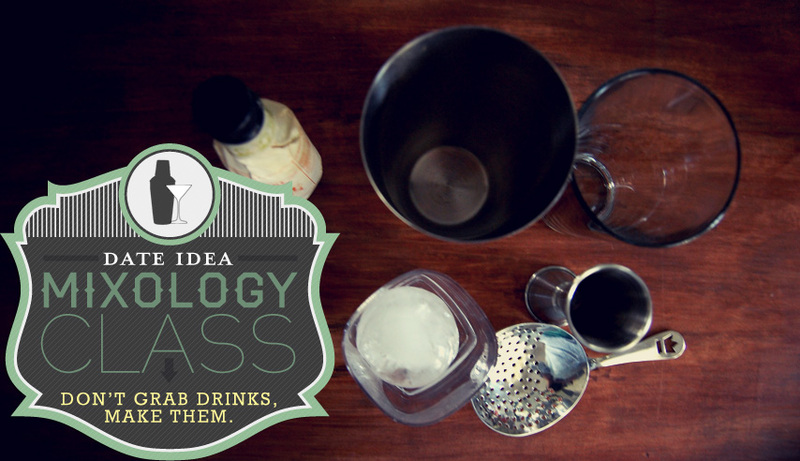 The next time you ask a girl out—and she agrees, of course—take her to a mixology class. Now, you may be a beer drinker. You may not like to indulge in the devil water, either. That's fine. You don't have to want to be Tom Cruise in Cocktail for this. Really. During my college days, like most of us I'm sure, I, uh, enjoyed partaking in the consumption of beverages containing alcohol. As a “bartender,” this was easy (It was in a college town.). And it would be a bold-faced lie to say I didn't enjoy it. But there was more to it than that. Making a perfect whiskey sour or an old fashioned—when we had the ingredients—was something to be proud of. It was a classy sort of drunk. And people loved it. Because, as it's so hilariously portrayed in Cocktail, people are impressed by that kind of thing. And who better to impress than your date on the first outing? It's easy to write ads for something like a mixology class. Most of it has to do with being able to wear a vest and tie to work but still being able to have your badass attitude. Or the movie Cocktail. But there's something inherently charming about bartending. Bartenders themselves play two parts in some of our lives: unofficial and sometimes reluctant therapist as well as all-around best-friend-after-5-p.m. But a bartender that's good, smooth and charismatic? Forget about it. Male or female, those are the people we love unconditionally for no damn reason at all. They're cool older siblings who aren't condescending or mean or judgmental. And there's some primordial part that no man can get away from that wants to be in that position. Take the class. Be that suave sonuvabitch. An amateur mixology class isn't chemistry. You won't “fail” if you fudge a drink. But it's also something perfectionists can truly enjoy, too. One ounce is an exact measurement after all. A mixology class date night is more about having fun. And this is coming from Jason Wooden, owner of JC Bartending School in Plano, Texas—the place that started bartending classes for those looking for a fun way to spend an evening. Wooden and his school serve a lot of people in those classes—some who take it more seriously than others. But they all have fun. It's relaxed. It's more like tending to a group of friends than a huge rush of customers during happy hour. The two-hour class Wooden puts on at JC is a social event—you can't just walk out and go to some high-class club and demand a job—but it is a legitimate class. It's like having your favorite subject (if that's drinking) with your best friend. Or soon to be girlfriend. And it's this social aspect that Wooden says makes the class so fun. It isn't sitting at a desk and trying to remember what goes into a Manhattan or a grasshopper. It's like a Montessori school for really, really cool people. And perfect for a first date. In other words, a great mixology class is a perfect segue into the rest of the night. Wooden's classes consist of a complimentary cocktail, a basic rundown of glassware and bar equipment, an explanation of the drinks and an overview of what students will be shaking or building. Then the lights go down and the music starts playing. Students are then challenged to make drinks—sometimes without recipes and relying on the guidance of a partner. And there is a competition to see who can do it best. The class ends with a recap of what the students did and questions and answers. And, if you take the 7 p.m. class, it ends at 9. Countless reasons, really. It's social. It gives you something to talk about after it's finished (which, admittedly, extremely good—and bad—movies do, too, but still). But it's also a shared experience. You make a connection with someone with whom you do something difficult. Plus, you learn a really valuable skill. Even if you end up not having that second date, at least you'll know how to make a perfect martini a week later. Now that you're out of school and your tastes grow as complex as your life, it's time to step up and do something out of the ordinary. It's time to take a girl out on a date that shows you're that interesting, charismatic person behind the bar other guys yearn to be. It's about time to show that, even though you like your scotch neat, you're willing to learn about a Rob Roy. And, of course, it's about time you stopped taking girls to see Johnny Depp play the same character in every single movie with different makeup on. Cheers, gentlemen, to a lovely first date and hopefully many more to come. Gin Ando is a news junkie and coffee addict. He currently works in advertising and cannot stop writing. As a post-college twentysomething, he too is navigating the adult world. And he needs friends. Follow him on Twitter @GinAAndo. JC Bartending is a great place. I am a graduate of their bartending school and they take care of their students during and after. Great seeing them mentioned here even sense I have left the Dallas area. Spot on — movie dates are TERRIBLE first dates. There’s no interaction, you’re not getting to know her at all, and you can’t really flirt with her too much while the movie is playing. The best thing for a first date is to take her somewhere that you’ve been wanting to go and that intersects with her interests. Simple as that. Definitely going to try this Mixology date, too. Perfect timing of this post.. I just took an online mixology/bartending class. Haha. I’ve been looking for a mixology class around Orange County, CA but none to be found. Anyone around here that may know of any? My lady-friend and I would have a lot of fun with this. What a great idea! Definitely going to bookmark it. Thanks!! If you live in CT, visit The CT School of Bartending. Charlie is a great guy, and he knows the business better than anyone. It’s a bit of a price, but the class is worth every penny. I did this over the summer, and I couldn’t help but think all the time how I should’ve brought my gf. I’m looking for a gift for my best friend’s bday. Any suggestions on great mixologist kits for home?